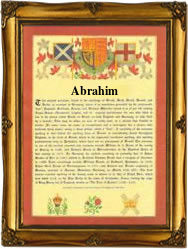 Recorded in over seventy spellings world-wide, and including such forms as Abram, Abrahamer, Avraham, Abramsky, D'Abramo, Brahms, Abrahamsson, Abramovitz and others such as Abrahim and Ibrahamin, this is a surname which can be Jewish, Muslim or Gentile, and which in origin pre-dates all known religious faiths. In Europe it was originally of Crusader origin, being one of the many names 'borrowed' from the Holy Land by the Christian knights of the medieval period. They struggled for three centuries with little success to wrest Palestine from the Muslims. As a contradiction the name in its various relative spellings is also Muslim, but all surnames however spelt are derived from the truly ancient personal name 'Avraham'. This word originally meant father or leader, and was also the name given to the founder of the Jewish people. The Domesday Book for the city of London in the year 1086, refers to a man called Abraham, who was a priest in the established Christian church, whilst in 1170 Abraham de Stradtuna was recorded in the Danelaw rolls of the county of Lincolnshire. The personal name continued to be used by Christians through into the 18th century, when it was also popular amongst non-conformists. The earliest known surname recordings in the world of the name are English and they include John Abraham of Bedford in 1273, and Magota Abram in the Poll Tax rolls of Yorkshire in 1379. Throughout the centuries, surnames in every country have continued to "develop" often leading to astonishing variants of the original spelling.